The 10 Best Cake Shops in Wisconsin! Who doesn’t like cake? From cool designs for themed parties and events to the best tasting batter—Wisconsin does it best. The best cake shops in Wisconsin put quality before anything else. Ditch the boxed cake mix and call up our favorite cake shops for you next celebration! If you’re in the Madison area and you need a tasty cake for you next event, you go to Carl’s Cakes located in Sun Prairie. They are an award-winning bakery located within The Market Street Diner. More than just wedding cakes, they do sheet cakes for birthdays, anniversaries and more. Try their raspberry-filled butter cream cake! Simma’s Bakery was voted one of America’s Top 25 Bakeries—so you know they’ve taken the cake (Get it?) in Milwaukee. This family-owned bake shop will knock your socks off with their tasty cakes. From cheese cakes to sheet cakes, all the way up to eccentric wedding cakes—Simma’s got you covered! Aggies’s Bakery and Cake Shop is loved by many in the metro-Milwaukee area. Ordering is easy and the cakes are delicious. Choose from cheesecakes, tortes, cupcakes, and your favorite cake flavors. Aggie’s has won WeddingWire Brides Choice Awards and is featured on The Knot. You know you’ll be getting a great deal at Aggie’s. Linda’s family-owned bakery located in West Salem has got western Wisconsin drooling over her cakes. She’s got 12 different cake flavors to win over everyone’s taste buds at your next event. Try their marble cake paired with their creamy chocolate butter creme frosting. Rolling Pin Bake Shop in Fitchburg does more than just serve tasty food. They also provide top notch cakes within the Madison area. Whether you are looking for a customer birthday cake, a specialty cake, or a gorgeous wedding cake—Rolling Pin Bake Shop does it all. Order away, the possibilities are endless. Washburn’s very own, Café Coco is more than just a café—ask about their cake selections! They have the perfect cake for your next event. From kid’s birthday parties to the most stunning wedding cakes, a cake from Coco is the way to go-go! Located on the outskirts of Madison is Craig’s cake Shop in Verona. They service cakes for all occasions. They have been voted Wisconsin Bride Magazine’s Best Cake for six years! Don’t just take our word for it, everyone in Madison loves Craig’s. 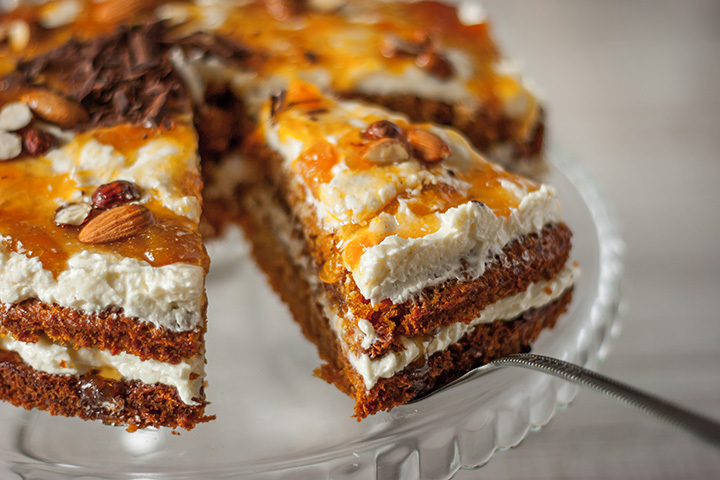 Try their delicious carrot cake with your favorite frosting today! Lakeland Bakery is taking cake orders! Name you’re your flavor, shape, size, and color. Leave the rest to the talented bakers at Lakeland Bakery. You’ll love all the of the different cake combinations. Try their fresh strawberry filled yellow cakes for the perfect summer get together! Uncle Mike’s award-winning Cake Shoppe is the tastiest in Green Bay. Voted Best of the Bay “Best Cakes” for 10 years in a row. There is no match for their quality cakes, beautiful, and tasty cakes. Try their made from scratch red velvet from scratch cake topped with their homemade cream cheese icing—you’ll thank us later for making Uncle Mike’s a member of your family! This fourth-generation, family-owned business has been crafting custom cakes for over 50 years. Rich’s will make you cakes for baby showers, graduation parties, holidays, anniversaries, weddings, and more—all designed to your liking. Rich’s is known for making top-quality creations. View more Wisconsin Bakeries and Pastry Shops.